Because appeals are an expensive and time-consuming process, you don't want to make that decision lightly. To help you make the right decision, we've now added appeals statistics with a separate subscription. Should I file a notice of appeal? We show you your chances of a good outcome (allowed claims), a neutral outcome (prosecution reopened), and a bad outcome (examiner affirmed). Should I let the board decide? If you are waiting for a board decision, you'll want to know your chances of success. Should I file a request for a Pre-Appeal Conference? For many examiners, it is a waste of time, but for some, it can get your case allowed more quickly. Below is a screenshot for a portion of our appeals statistics for a case where I recently filed a notice of appeal. For this examiner, it is a really easy decision to appeal. Only 5% of appeals have bad outcomes. 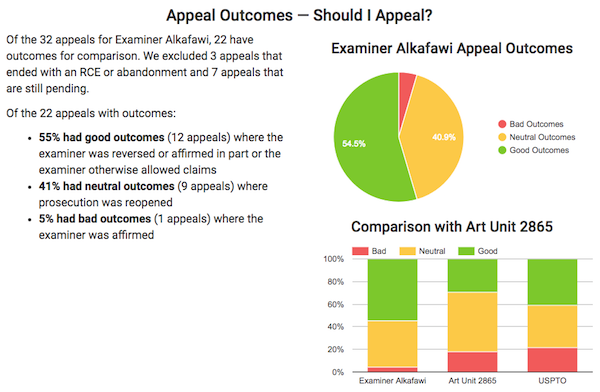 In other portions of our statistics not shown below, you can see that this examiner frequently allows cases during the appeal process and is reversed by the board 80% of the time. We also present appeals statistics for art units, groups, and tech centers, and the tech center statistics are available for free to help you evaluate the usefulness of appeals statistics. Here are appeals statistics for Tech Center 2800. Please contact me if you'd like to sign up for one of our subscriptions.